It was one of those moments of delightful ‘accident’ or serendipity. I was browsing a small bookstall in a retreat centre recently and came across this little book by David G. Benner. It is a book about prayer but it is so much more: it offers practical guidance while also giving psychological insight and glimpses of profound theology. Benner is a Canadian writer on spirituality with a professional background in clinical psychology and the teaching of spirituality. He argues that prayer is primarily an expression of our relationship with God. It is more than ‘saying prayers’, it is ‘being with the Beloved’, a relationship which spills out into the whole of life and leads to personal transformation. There are many practical suggestions about the ‘how’ of prayer in this book, but the author begins by arguing that prayer is not something we do but something God does in and through us. Prayer is the act of breathing in the love of God and then breathing this same love back out into the world. The evangelical roots of this author are in evidence as he shows the importance of Scripture in nourishing the life of prayer. The traditional method of lectio divina (spiritual reading) is explained and then its four stages are used as a way of exploring the many dimensions of prayer. So lectio (reading) leads to ‘prayer as attending’, meditatio (meditation) leads to ‘prayer as pondering’, oratio (prayer or speaking) leads to ‘prayer as responding’ and contemplatio (contemplation) leads to ‘prayer as being’. Along the way, Benner explores the importance of silence, honesty and imagination. He explains clearly such forms of prayer as the examen (the prayerful recollection of the day), the Jesus prayer, pondering art, journaling, conversational prayer and centering prayer. A key concern is that prayer should be holistic. In part, this means that, whatever our personality or spiritual tradition, we should broaden the repertoire of our praying. But holistic prayer also means that our prayer activity should move beyond our times of prayer to transform the whole of our lives. This is quite simply the best book on prayer that I have read. It’s first reading will excite and encourage and re-reading will offer rich reflections and practical guidance. On a scale of one to five, I give this book six stars! 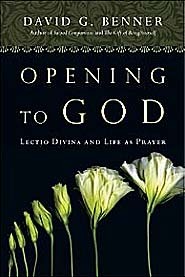 I have come across the concept of Lectio Divina but this looks like a good introduction. When i get back from Finland I think I will look at buying this. Today I went to the Baptist church in Tampere – I had emailed the Pastor and his Chairman to say I was here and find out about services. Unfortunately it does not look like I will be able to go to a service while I am here. I was walking past today and feeling a bit homesick and noticed there were people in the building so I went in and was able to meet the Chairman and see the church. This was definitely a time of prayer in action and I can now reflect on that.